Three tours of the USTUR’s laboratory facility were given to attendees of the Low Dose Conference in Richland, WA, September 30 – October 3, 2018. Prior to the meeting, Oleg Belyakov of the International Atomic Energy Agency (IAEA) gave a presentation at the USTUR titled, “Overview of NAHU/ARBR Radiation Biology Coordinated Research Projects (CRPs)”. 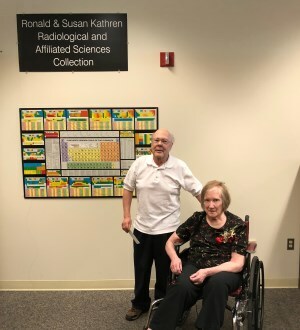 This was followed by a tour of the laboratory facility, which includes an autopsy room, a radiochemistry laboratory, an alpha spectrometry counting room, and a sample storage area. During the conference, several additional individuals expressed interest in a laboratory tour. A tour was given to Michael Bellamy and Sandra Davern of Oak Ridge National Laboratory, and Yuliya Lyamzina of Fukushima Medical University, Japan. The different types of tissue materials that are available at the USTUR, such as frozen organs and paraffin embedded tissue blocks, were discussed. Following the tour, Maia Avtandilashvili demonstrated unique features of the USTUR’s academic version of the Integrated Modules for Bioassay Analysis (IMBA) biokinetic modeling software. 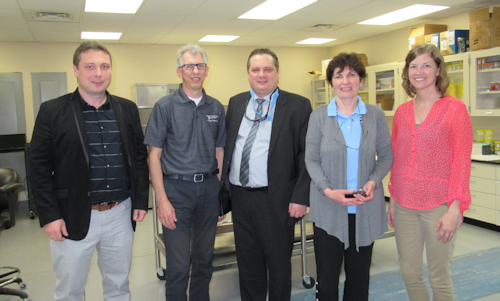 An additional tour was given to Doug Boreham (Bruce Power, Canada), Stephanie Puukila (Flinders University, Australia and Laurentian University, Canada), Jake Pirkkanen (Laurentian University, Canada), and Christopher Thome (Northern Ontario School of Medicine, Canada). The 2018 Meeting of the Conference on Radiation & Health (CRH) was held in conjunction with the Radiation Research Society’s (RRS) annual meeting in Chicago, IL, September, 23-26, 2018. The USTUR was well represented at the joint meetings, with one invited lecture and one poster at CRH, and two posters at the RRS meeting. The invited lecture was given by USTUR director, Sergei Tolmachev, as part of a special session on International and domestic health studies among radiation exposed. This special session was organized by the Department of Energy’s Office of Health and Safety. Sergei Tolmachev and Maia Avtandilashvili were appointed to serve on the new National Council on Radiation Protection and Measurement (NCRP) scientific committee (SC 6-12) on the Development of Models for Brain Dosimetry for Internally Deposited Radionuclides. Dr. Tolmachev will serve as vice chairman. Sara Dumit and her graduate committee: Sayed Daoud, Kathryn E. Meier, Sergei Tolmachev, Jeannie Padowski, Daniel Strom. The USTUR is pleased to announce that USTUR/College of Pharmacy student, Sara Dumit, successfully defended her doctoral dissertation on May 14, 2018. Her dissertation, titled “Development of a new compartmental model for plutonium decorporation therapy,” describes a new biokinetic model for the removal of plutonium from the human body following administration of the decorporating agent DTPA. Ms. Dumit will submit a paper describing the model to the Health Physics journal. Sergei Tolmachev participated in the 3rd Million Person Study workshop, held at Oak Ridge National Laboratory on May 2-4, 2018. 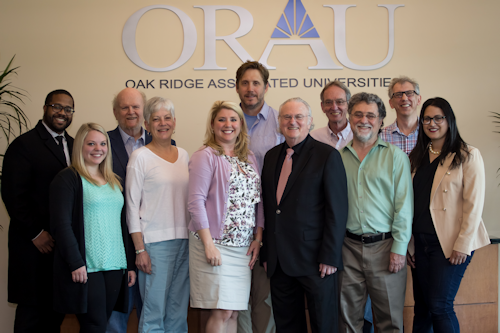 L to R: Michael Bellamy (ORNL), Katie Bayles (ORNL), Keith Eckerman (ORNL, NCRP), Betsy Ellis (Oak Ridge Institute for Science and Education, ORISE), Ashley Golden (ORISE), Mike Mumma (Vanderbilt, IEI), John Boice (NCRP, Vanderbilt), Rich Leggett (ORNL), Luiz Bertelli (LANL), Sergei Tolmachev (USTUR), Shaheen Dewji (ORNL). Photo courtesy of M Bellamy.